As a child of the early ’80s, Peter Kugler dreamed about making games long before it became his day job. His first game idea, at around age 4, involved — appropriately enough — piloting a Pac-Man spaceship and shooting down enemy Star Wars ships with power pellets. 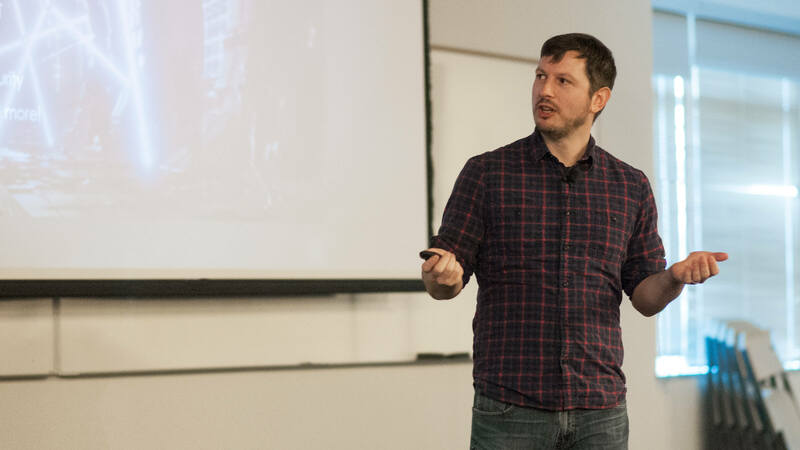 These were just a few of the early memories that Kugler, a 2007 graduate of the BS in Computer Science in Real-Time Interactive Simulation program and a lead engineer at renowned game studio Bungie, recounted to an audience of about 250 campus visitors on Saturday during a special presentation. In addition to sharing some insight into the history of Bungie and the many roles that make up a modern development team for games like Destiny 2, Kugler spoke at length about his own journey into the world of professional games. His childhood daydreams aside, Kugler says it was a long time before he really began to make his first concrete steps toward the practice of making video games. Years later, in high school, Kugler learned how to program games on a graphing calculator — games he was able to share with other people. Being the child of a military parent, whose family frequently moved, games became a hobby that helped Kugler make new friends and acquaintances. One example that proved successful was using the Japanese-developed RPG Maker for the Sony PlayStation — a game where players could create their own mini adventures and scenarios. In this case, Kugler and his wife used the game to create interactive history lessons, initially for a pilot history education program at his wife’s middle school. During one of these lessons, Kugler was approached by a student named Sally who mentioned something that stuck with him. Kugler says he came to a crossroads. On the one hand, he considered pursuing his doctorate in curriculum development, a path that would allow him to continue creating and investigating new forms of learning experiences. Or he could finally focus on learning to make games, a path that would not only satisfy his own curiosity but perhaps also lead to new ways of educating others. He chose the latter option and soon found himself moving to the Pacific Northwest to attend DigiPen. In addition to attending classes, Kugler also began working with the Bellevue School District to develop educational courses in computer science and media technology — some of which incorporated basic game-making lessons. During the summer before his final year at DigiPen, Kugler landed an internship position at Treyarch in Santa Monica, California, where he worked on the game Call of Duty 3. After graduating, he started his first full-time development position at Microsoft Game Studios, a position that a few years later led to him joining the 343 Industries team that worked on Halo 4 and other Halo titles. And from there, it was a former DigiPen classmate who would eventually help recruit him to Bungie, which he joined in 2013. Today, as lead tools engineer, Kugler has worked on both the original Destiny and its 2017 sequel, Destiny 2. He’s also heading up a new internship program that he hopes will serve as a pathway for young game developers to get their start in the industry. With about 700 employees, including dozens of DigiPen graduates, Bungie itself is comprised of many roles and job types — from artists to audio designers to software engineers — each belonging to any number of small, dedicated teams. It all goes to demonstrate the enormous effort and diversity of talent that’s required to create something as massive and technologically sophisticated as Destiny 2. “The design work … isn’t the result of just one hero’s work or one small team’s work. It’s actually the result of a collective body of work across the whole company, which is really neat,” Kugler said.